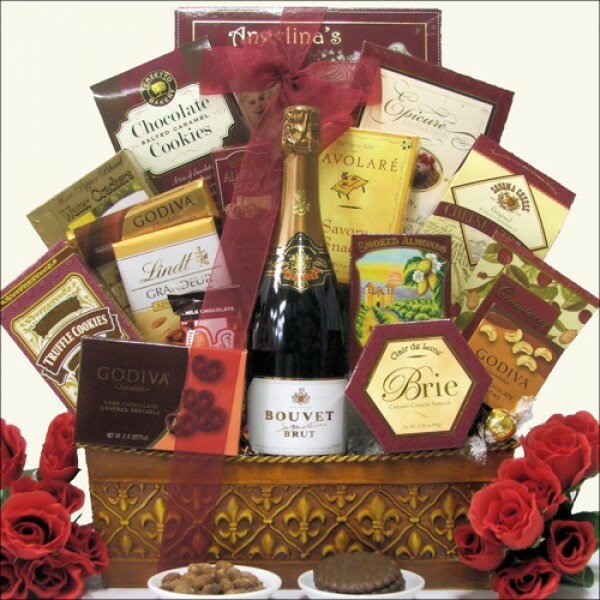 Send them this elegant gourmet gift basket that is perfect for any occasion. The 'Sparkling Gourmet' Champagne gift basket gives you the option to pick one bottle from our selection of six upscale champagnes. The bottle of champagne is surrounded by a delicious selection of chocolates, cheese, cookies and snacks. All of these wonderful items are beautifully arranged in a Copper Rectangular Tin with Embossed Fleur de Lis Design. ...in a Copper Rectangular Tin with Embossed Fleur de Lis Design.